Karambit – Karambit is pronounced kha-rhom-bit. The Karambit (sometimes spelled as “Korambit”), in some places in the Philippines, it is called the Sanggot, is an all purpose/utility knife that was carried by the Indonesians since the 11th century, and can still be seen in some provinces throughout their islands. Although this type of knife was introduced in the art of Indonesian Pencak Silat, only a few people knows that it’s roots can also be traced in the Martial Arts of Malaysian Bersilat, and Filipino Kali. 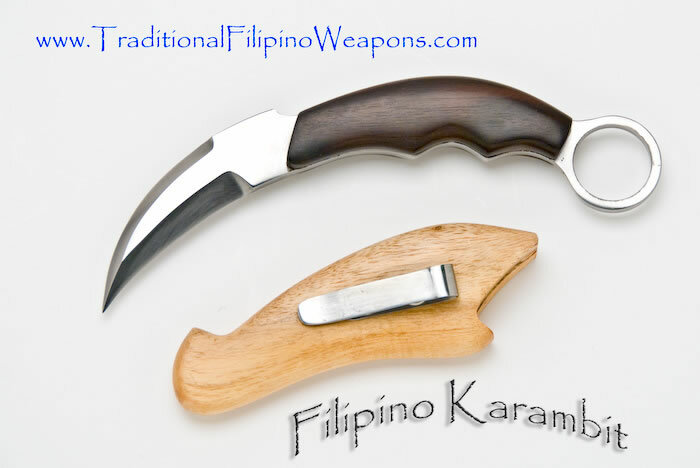 In the Philippines, the Karambit is called the “Lihok.” Pronounced Lee-hok! (sometimes you will see it spelled like this, Lehok or Lijok or Lejok) The word, “Karambit” is the most common word among English speaking people! It was not meant to be used for combat since Karambit is first and foremost, a tool. It evolved only because of the necessity of the people of these three Asian Countries to protect themselves from foreign invaders. This razor sharp Karambit is made of steel blends of D2 and 5160 with a sodium nitrate heat treatment. Each knife was carefully hand forged and heat-treated to 59 to 61 rock tempered scale. This same treatment is used by the Japanese sword makers in tempering the katana. Just like all steel, high carbon steel will rust if the owner does not give time for care and maintenance of the blade. Simple oiling (thin application only) will keep the Karambits from rusting like hell. Salty water, sweat, blood, and carelessness, will surely darken your blade. But it will not affect the steels performance. It can still kill and go through the human skull or anywhere on a body very easily. Keep it sharp by using steel rods and stones. Hand sharpening is still the best way to keep your Karambits handsome and happy. Always find an expert sharpener so you do not ruin the temper of the steel blends used on this Karambit. 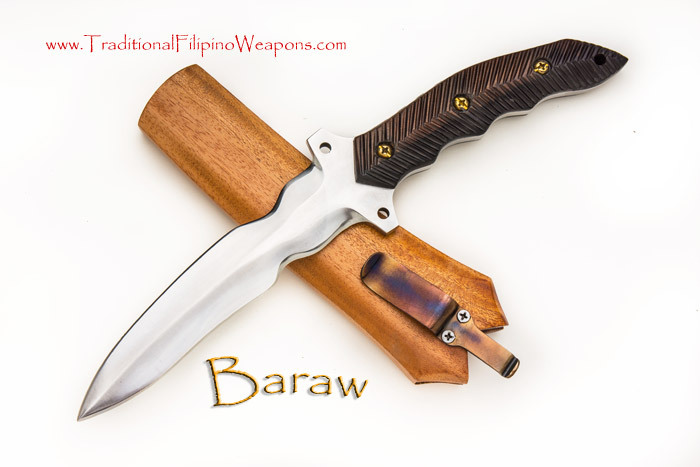 This Filipino Karambit is single edged however, it can be sharpened easily enough on the spine of the blade to be double edged if you wanted that. Then again, why interfere with such beautiful artwork? To order by phone, please have your Credit Card information ready.